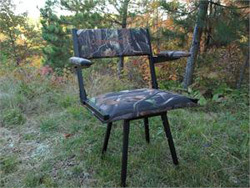 It's no longer necessary to lug your old office chair to your hunting spot. Just transport the ComfortQuest SPORT Chair in its own carry bag to enjoy the most comfortable, lightweight, packable, swivel arm chair that;'s perfect for Hunting! Get an additional set of legs that fit the ComfortQuest Sport and "Big Boy" Chairs and provide “Low Profile” Seating for the Turkey hunter or for hunters to use in blinds with low set windows. The ComfortQuest "Big Boy" Chair provides plenty of room and comfort for the big boys! New Product available NOW !